Originally from South Africa Ixia are a corm, rather than a bulb that flower in spring. These easy care plants are originally from South Africa and are sometimes called ‘Corn Lilies’. A number of varieties are available for sale online. In a sunny position and well drained soil, these are a reliable flowering bulb that add colour to any garden. Ixiae are a spring flowering bulb with a number of species and many named varieties available for sale in Australia. Also known as the ‘corn lily or wand flowers’ Ixia make great cut flowers courtesy of the tall strong stems. I maculate is a yellow flowering species, but variable with tones ranging from yellow through to red (picture right) and almost purple. These plants are grown from small bulbs or corms, originally from fairly free draining sunny positions and require this to grow well. A free draining good quality potting mix will be required if growing in pots. 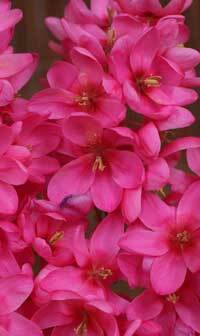 Bulbs are planted at around 7cm (3 inches) deep and then watered in well. Ixia do not require a lot of fertiliser, however as clumps expand soil will naturally become exhausted and larger clumps can be divided and replanted during summer dormancy. Water when new growth starts, but Ixia are fairly drought tolerant. I. dubia – Yellow flowers with contrasting black centres. I. polystachys ‘ alba’ – White flowering. I. viridifolia – wonderful turquoise flowers.